Millions of adults in the United States suffer from various types of chronic pain conditions. The pain associated with these conditions can be severe and can have a detrimental impact to an individual’s personal and professional lives. Additionally, chronic pain has a significant impact on the U.S. economy, resulting in increased healthcare utilization, including rehabilitation and decreased worker productivity. Patients suffering with chronic pain are often treated with a combination of medication, physical therapy, as well as epidural steroid injections and other conservative treatment options. However, not all patients experience pain relief from these treatment methods. Radiofrequency lesioning is a minimally invasive procedure that may be used to treat chronic pain that has been unresponsive to conservative measures. Radiofrequency lesioning uses heat to effectively destroy the sensory nerve endings that are believed to be the source of pain. By destroying the nerve endings, pain and other related symptoms are reduced following treatment. 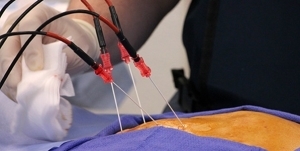 Before recommending radiofrequency ablation, diagnostic local anesthetic nerve blocks need to be performed to ensure that the patient is an ideal candidate. A diagnostic nerve block involves injecting a local anesthetic into the area of the nerve that is believed to be causing the patient’s pain. The local anesthetic essentially temporarily numbs the area and should result in reduced pain symptoms. The effectiveness of radiofrequency lesioning can be predicted from a patient’s response to the temporary nerve block procedure. How Is Radiofrequency Lesioning Performed? A radiofrequency lesioning procedure is performed in an outpatient setting. Generally, radiofrequency lesioning procedures take approximately 30 to 60 minutes to complete. The nerve supply to the painful structure is targeted during a radiofrequency lesioning procedure. A small needle or radiofrequency cannula is positioned next to the targeted nerves using fluoroscopic guidance. 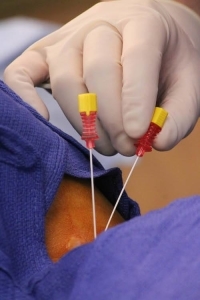 Once the needle is in place, small currents are applied to ensure proper needle placement. Once the proper placement of the needle or cannula is confirmed, a local anesthetic is injected to numb the area. The radiofrequency generator is then utilized which delivers an electrical current that produces radiowaves. These radiowaves heat the targeted nerve ending for up to 90 seconds, which results in destruction of the targeted nerve. The needle is then removed and the procedure is complete. After the procedure, patients may experience discomfort around the needle placement site, which usually subsides within a few days. Occasionally, patients may experience temporary burning or numbness, which usually subsides within a few weeks. The risks associated with radiofrequency lesioning include: bleeding, infection, or allergic reaction to the local anesthetic used during the procedure. Rare side effects include: nerve damage, which may lead to permanent altered sensations including numbness, burning, tingling, and possibly extremity weakness. Radiofrequency lesioning procedures generally provide long-term pain relief; however, the pain pathways may regenerate over time. Therefore, it is possible that the procedure may need to be repeated. Facet joint pain is one of the most common causes of chronic spinal pain. Radiofrequency lesioning of the medial branch of the posterior primary ramus can denervate the facet joint and effectively provide long-term pain relief for some patients. Successful radiofrequency lesioning for patients suffering with facet joint pain typically lasts for more than a year. Spinal pain that is arising from the intervertebral discs of the spine is another common source of pain, commonly referred to as discogenic pain. Once the painful disc is identified radiofrequency lesioning can be used to partially denervate the intervertebral disc, by either lesioning the rami communicans, or by using intradiscal denervation techniques. The use of radiofrequency lesioning is contraindicated if there is a disc herniation that is causing nerve impingement, if there is disc disease at multiple spinal levels, or if there is advanced degenerative disc disease. Coccydodynia (tailbone pain) that is the result of organic causes can be treated by radiofrequency lesioning of the coccygeal nerve or the ganglion impar. Prior to using radiofrequency lesioning, a minimum of two blocks are performed to confirm that the pain is organic in nature. Pain that is transmitted by the sympathetic nerves may be treated using radiofrequency lesioning by lesioning the sympathetic chain at the spinal level or at the stellate ganglion. This results in an interruption of nerve signal transmission. Additional radiofrequency lesioning can be used to treat trigeminal neuralgia by thermocoagulation of the Gasserian ganglion. It can also be used to treat nociceptive radicular pain by partial rhizotomy of the dorsal root ganglion. Furthermore, it can be utilized to treat cancer pain by lesioning the sphenopalatine ganglion and stereotactic cordotomy. Millions of adults suffer from chronic pain conditions in the United States. Patients suffering from these conditions not only experience physical symptoms, they often also suffer emotionally and physically if their pain cannot be effectively managed. Radiofrequency lesioning is a minimally invasive method that can be used to effectively treat pain that has been unresponsive to conservative treatment options. The nerves that are believed to be responsible for causing pain are targeted during a radiofrequency lesioning procedure. The targeted nerves are destroyed by the application of heat. Radiofrequency lesioning can be used to treat a variety of conditions including facet joint pain, discogenic pain, tailbone pain, and sympathetically mediated pain. Radiofrequency lesioning is generally safe; however, as with any surgical procedure, there are minimal risks involved including mild injection site soreness, bleeding, infection, and temporary altered sensation in the extremities. Serious side effects are very rare. Patients suffering from unresponsive spinal pain should discuss the possibly of radiofrequency lesioning with their physician, as it may provide effective, long-term relief of their symptoms. Principles and uses of radiofrequency nerve lesioning in chronic pain control – Cabell Huntington Hospital – Huntington, WV. 2015. Geurts JW, van Wijk RM, Stolker RJ, Groen GJ. Efficacy of radiofrequency procedures for the treatment of spinal pain: a systematic review of randomized clinical trials. Regional Anesthesia and Pain Medicine. 2001;26(5):394-400. Kawaguchi M, Hashizume K, Iwata T, Furuya H. Percutaneous radiofrequency lesioning of sensory branches of the obturator and femoral nerves for the treatment of hip joint pain. Regional Anesthesia & Pain Medicine. 2001;26(6):576-581. Kornick C, Kramarich S, Lamar TJ, Sitzman T. Complications of lumbar facet radiofrequency denervation. Spine. 2004;29(12):1352-1354. Nagda JV, Davis CW, Bajawa ZH, Simopoulos TT. Retrospective review of the efficacy and safety of repeated pulsed and continuous radiofrequency lesioning of the dorsal root ganglion/segmental nerve for lumbar radicular pain. Pain Physician. 2001;14(4):371-376. Oh WS, Shim JC. A randomized controlled trial of radiofrequency denervation of the ramus communicans nerve for chronic discogenic low back pain. Clinical Journal of Pain. 2004;20(1):55-60.
org. American Academy of Pain Medicine – Get The Facts on Pain. 2015. The post Radio Frequency Lesioning appeared first on Pain Doctor.